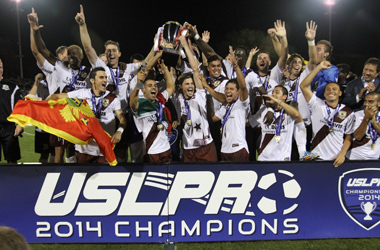 This weekend was pretty monumental for our town of Sacramento — our team Sacramento Republic FC (yep, FC stands for Football Club) won the United Soccer League (USL) professional championship in its first season. We went to the game and witnessed the big win in person. In one year, I’ve seen our town evolve into a truly spirited soccer (or I should say football) town and it’s exciting! The team has managed to energize our town and bring pride back to our city. I never was a big football fan when I lived in the U.K., but now that I’ve started watching the games, I finally get why it’s the world’s game. I’m probably preaching to the choir here, but if a sportsphobe like me can change, well, anything is possible! And I have no doubt that the best is yet to come for Sacramento. Posted on 29, September 2014, in sports and tagged British, championship, football, Sac Republic FC, Sacramento, soccer, USL PRO. Bookmark the permalink. Leave a comment.